The VWR General Purpose Undercounter Refrigerator provides flexible placement, and convenient storage for everyday use in your lab. This lab refrigerator is best for use where precise temperature control and stability aren’t critical, and alarms are unnecessary. This Undercounter Refrigerator has a temperature range of 0 to 10°C, adjustable from the analog control knob inside the unit. The exterior of this undercounter lab fridge is a corrosion resistant, with an easy to clean interior, and a solid door, with extra storage for materials and a 0.95 cm probe access port for external monitoring. 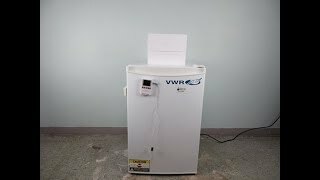 This VWR 4° Undercounter Lab Refrigerator SCUCFS-0404 has been fully inspected and is operating without issue. All of our lab equipment comes backe with our standard warranty. Should you have any questions, please don't hesitate to contact us.